According to Frost & Sullivan, customer experience will overtake product and price as the number one means of differentiation for organisations by 2020. Companies that get their customer experience (CX) right are rewarded, with 74% of consumers spending more with a business due to a history of good service. While most companies understand the importance of delivering a positive CX, creating and deploying the right tools to create happy customers remains a challenge. If you’re looking for CX inspiration and help in developing a successful strategy, don’t miss the C+UX Expo taking place in London on 27 & 28 March. Tickets for the UK’s biggest customer and user experience event are free and will give you access to several other co-located events, including the Call & Contact Centre Expo and the Marketing Technology Expo. Creative Virtual Founder & CEO, Chris Ezekiel will be presenting a seminar on Thursday at 14:00 in Theatre 16, ‘Top Tips for Implementing Chatbots and Virtual Agents in 2019’. Be sure to join Chris as he cuts through the artificial intelligence (AI) and chatbot hype to share best practices for selecting, deploying and maintaining a successful self-service solution. Drawing on demos of live implementations, he’ll cover everything from building your business case to setting your solution up for long-term success. The Creative Virtual team will also be on Stand 920 both days of the event sharing insights and live demos of our award-winning virtual agent, chatbot and live chat solutions. Our multi-lingual technology can be deployed across touchpoints – web, mobile, social, messaging apps, SMS, contact centre, service desk, IVR and smart speakers – to deliver information quickly and efficiently to customers and employees. Stop by to see some of our current implementations in action and learn how we are helping businesses implement these solutions to create seamless omnichannel engagement. Tickets for C+UX are free, but you must register in advance through the event website. If you aren’t able to attend the expo but are interested in learning more about how you can optimise digital conversations with your customers and employees, request a personalised demo with an expert member of our team. With chatbot companies springing up on an almost daily basis, how do companies select the right one? Well, now the work has been done for you and there’s a clear choice! 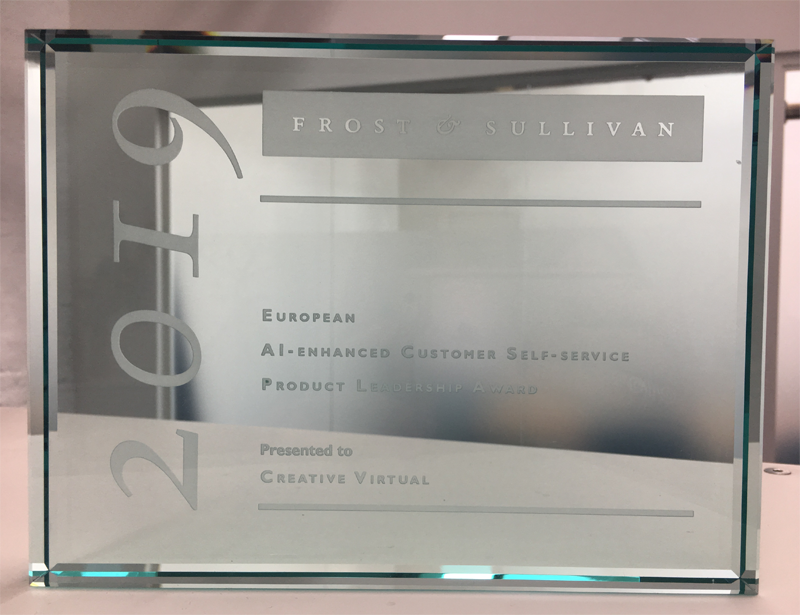 Frost & Sullivan have recognised Creative Virtual as the Product Leader! And the full report is available for you to download for free. Frost & Sullivan evaluated companies across two key factors, each with five benchmarking criteria. Creative Virtual was rated as ‘Excellent’, receiving an average score of 9.00/10 across these categories. The second and third place companies came in at 8.50 and 8.25. As we celebrate our fifteen year anniversary, I cannot think of a better way to start the year (and the celebrations!). Not least because this is the first detailed independent comparison of combined virtual assistant, chatbot and live chat technology; and especially as the competition are some of the world’s largest technology companies. This comes on the back of our Queen’s Award for Innovation, that we were honoured to receive in 2017, and which is a five-year award. I couldn’t be more proud of what our team, together with our customers and partners, have achieved. We often get asked how we compare with our competitors, and of course we have a lot to say on the subject! – but now with this independent report, the choice for companies wanting to deliver significant business value as well as superior customer experience, is crystal clear! As a company that prides itself on continuous innovation, we certainly won’t be resting on our laurels. Right now, in our labs around the world, we are working on even more exciting developments that we look forward to bringing to the market soon. And in the meantime, we’re very much looking forward to shouting about this amazing achievement from the rooftops! It’s an honour to be leading a global company that has been acclaimed as the leader, and I know it will also mean a lot to all our great people, as well as our customers and partners who have put their trust in us and worked hard with us to create amazing solutions – which I know have played a pivotal role in this award. I would like to publicly say a big thanks to all our supporters! https://www.creativevirtual.com/wp-content/uploads/2019/03/FS-Award-Dinner.png 423 785 Mandy Reed https://www.creativevirtual.com/wp-content/uploads/2017/12/site-logo.png Mandy Reed2019-03-21 10:26:542019-03-21 10:26:54Simply The Best! There’s such a buzz around artificial intelligence (AI) and chatbots today, and it’s certainly a space that has changed a lot since I founded Creative Virtual 15 years ago. The learnings we have gained over the years are an important differentiator for our company and positively influence how we develop and implement our technology. During a recent webinar with Engage Customer, I shared some of those learnings and took attendees through current industry trends and best practices as well as sharing some new innovations. My goal was to show how organisations can orchestrate a seamless and efficient customer experience (CX) across contact channels with chatbots, virtual agents and AI to improve the experience whilst also saving costs. The virtual agent, chatbot and live chat market is very crowded today with new vendors popping up all the time, and it’s confusing with all the buzz and mixed messages about AI. One of my key tips for any organisation looking at these solutions is that, whether you’re talking about the technology itself or the way chatbots and live chat are implemented and maintained, it’s the people element that’s absolutely crucial. It’s just as much about working with a vendor that can provide consulting expertise as the actual technology. The two need to come together hand-in-hand for a successful project, and that’s something we are very proud to offer at Creative Virtual. I’m sure it’s not surprising to anyone reading this that over the past several years, customers consistently identify the same factors as being most important when it comes to customer experience and service: efficient, reliable, effortless, flexible. The good news for organisations is that machines, combined with humans, can help them deliver on all these expectations. Another of my key tips is to implement an orchestration platform that can bring together all of your content sources, manage the intents and keep the conversations flowing across all customer touchpoints completely seamlessly in a personalised way and at large scale. The V-Portal™ platform that powers our chatbots, virtual agents and live chat does this while also allowing you to learn from all those conversations going on in real time in such a way that a human, the content owner, works alongside the machine learning component to provide the best possible CX. It’s the machine learning and human curation parts coming together in a hybrid model that makes all of this possible. The orchestration platform is at the heart of creating a seamless and efficient experience. The best way to understand this is to see real examples, so be sure to watch the webinar recording to see the live demonstrations I shared. You’ll also want to check out the eight recommendations I gave for organisations who are looking to implement chatbots, virtual agents and live chat or want to improve any of those tools they already have in place. My thanks to Steve Hurst and Engage Customer for hosting this webinar and to all the attendees for their great questions and feedback. You can watch the full recording of Orchestrating a Seamless and Efficient Customer Experience on-demand here. We live in an always-on world with instant access to information and news and trending hashtags always at our fingertips. There have been numerous studies done about the effects of digital devices and the growing need to always feel connected. As I’m writing this, I have no electricity or internet access thanks to the power of mother nature which, I’m slightly embarrassed to admit, is giving me a good bit of anxiety about the percentage of battery left on my smartphone – my one connection to knowing what’s going on in the world without actually having to leave my house! It’s certainly no secret that this new normal of constant digital connection and instant access to information in our personal lives has also changed our expectations for our engagement with businesses and brands. Organisations are facing the challenge of delivering a quality support experience over a growing number of contact channels. Messaging apps, like Facebook Messenger and WeChat, and smart speakers, like Amazon Alexa and Google Home, have been added to existing touchpoints, like the phone, website and social media, instead of replacing them. On top of that, many organisations are struggling with lots of disconnected information sources making it difficult to keep content updated and deliver the right information to customers on all channels. So how can organisations bring this all together to create a consistent, convenient and efficient customer experience? Register now for the webinar Orchestrating a Seamless and Efficient Customer Experience. Can’t attend the live event? Don’t worry, a recording will be sent to all registrants after the webinar. You can also request a personalised demo to see how our technology can help you deliver seamless, consistent support and increase customer satisfaction scores. It’s impossible to talk about customer experience without also talking about technology. Companies and brands are looking to provide a complete omnichannel experience for those at a desk and on the move, deliver quality service and support to digitally-savvy customers and remain competitive as a growing number of contact channels gain popularity among consumers. All of those goals involve not only implementing, but also integrating the right customer experience (CX) technologies. 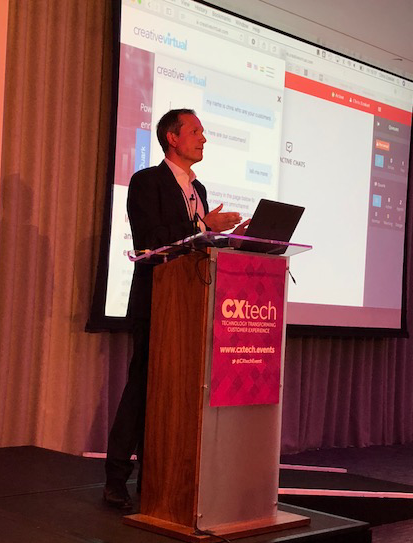 Earlier this month I attended CXtech, a new technology conference and showcase focused on what’s new, what’s working and what’s coming next in CX technologies. One major theme that came up repeatedly during presentations and my discussions with other attendees was that the truth about artificial intelligence (AI) is now been revealed after all the hype, myths and unrealistic claims. The CX industry is coming together in agreement that a hybrid approach is best – using a combination of AI and humans to deliver the best experience for customers. This is the approach we’ve always taken at Creative Virtual, and one that we’ve seen industry analysts and experts talking about more and more recently. Chris Ezekiel, Founder & CEO, joined me at the event and presented as part of the ‘Digital Automation, Chatbots and Virtual Assistants’ stream. His session, Digital CX & the contact centre: AI, chatbots, live chat & knowledge management, was well-received by attendees. He talked about the essential components of AI-driven digital transformation in the contact centre and then showed them how organisations are already using our CX technologies through a series of live demonstrations, including one of our customer chatbots working on Amazon Alexa. It’s one thing to listen to someone talking about the possibilities of the technology; it’s another to actually see and experience the solutions working and delivering on those promises. We had a mix of people from different areas of organisations – the contact centre, digital CX, marketing, etc. – stop by the Creative Virtual stand throughout the day, some expressing that Chris’ presentation showcased ‘exactly what we are looking for’. There was lots of interest in discussing how to support customers on social media and messenger apps like Facebook Messenger. I also spoke with attendees from organisations that aren’t part of the industries we typically see at these types of events, such as public and emergency services. This reflects the change we’re seeing in the CX market as a wider range of industries are feeling the pressures of cultural and digital changes. Our thanks to the CXtech organisers for putting together a successful event. It was a day of great presentations and insightful discussions, and I especially enjoyed the salmon at lunch! If you’re interested in learning more about AI-driven transformation in the contact centre, download our latest whitepaper A Chatbot for Your Contact Centre. And if you’d like to see our chatbot, virtual agent and live chat solutions in action, be sure to request a live demo to arrange a personalised demonstration. CXtech, a new technology conference and showcase, is coming to London on 12 October. Co-located with AI & Robotics: The Main Event, CXtech will explore what’s new, what’s working and what’s coming next in customer experience (CX) technologies as companies are connecting with customers like never before. Previously a sponsor of the AI & Robotics event, Creative Virtual is pleased to be a partner for CXtech this year. The event brings together thought leadership, innovation and current case studies covering a wide range of CX technologies. In addition to presentations from expert speakers, attendees will also have opportunities to take part in networking sessions and visit the Solutions Showcase to see demonstrations of CX solutions. Chris Ezekiel, Founder & CEO of Creative Virtual, is one of the expert speaker at the event, presenting as part of the ‘Digital Automation, Chatbots and Virtual Assistants’ stream. His session, Digital CX & the contact centre: AI, chatbots, live chat & knowledge management, will address the essential components of AI-driven digital transformation in the contact centre. Chris will share live demonstrations of chatbot and live chat implementations and discuss industry best practices for implementing successful digital CX initiatives. The Creative Virtual team will also take part in the Solutions Showcase, providing live demonstrations of our award-winning chatbot, virtual agent, live chat and knowledge management solutions. Be sure to stop by to see some of our current implementations in action and learn how we are helping brands implement these solutions to create seamless omnichannel engagement. We’ll also be sharing tips to help you build a business case for these CX technologies in your organisation. You can find more information about CXtech and the full conference programme on the CXtech website. If you haven’t registered yet, be sure to use our promotional code CV295 to receive a £300 discount off the price of a single ticket. If you aren’t able to attend the event in London but want to learn more, we’d love to arrange a personalised demo at a time that works for you. In our digitised world, with expectations for immediate access to a variety of informational touch points, is it right to assume that we are losing our ability to have a one-to-one discussion that doesn’t involve a social forum? Are we so “busy” that we’d rather just get an answer than exchange any pleasantries? I’m not convinced, but I bring it up to make us think about how we interact with our phones, desktops, social media apps and any home assistant device – an important consideration as we celebrate CX Day. On many occasions we use social media to advertise in some way – it can be a product, photo, achievement or opinion. These channels call out for banter and hoped-for positive communication. Our home devices (Amazon’s Alexa or Google Home) often exist to provide “fluffy” help (turning on lights/heat/oven) but also can act as a personal advisor offering bedtime stories, the weather, a joke or football stats. Currently I think it is safe to say that our desktops, tablets and phones are often the devices used the most to seek out a deeper level of information and help – whether it be to research a subject, reach out to individuals for a longer email or finally to get help on an account, including learning about the levels of service or complaining about a problem. People use Twitter and Forums often to advise others of a poor customer service or a really good one, but email or help areas with FAQs and chat services are where most of us go to find out how we can be served more in-depth with our specific issue. Consequently, when things get more specific, a “pre-chat” of some sort usually occurs. In the pre-internet days, people either picked up the stationary telephone or had to go into a shop or bank during office hours to clarify any concerns or support issues. There was a level of formality to the process, but now the protocol is more about ensuring voices are not raised on a live chat handover or indeed that profanity and insults are avoided at the risk of being cut-off from the session. All of these scenarios involve a chat of some kind in order to ease off the customer’s anger and for the agent to familiarise him/herself with the issue. Personalisation (virtual or in-person) is an expectation and if a user logs on to a smart system, the system can be programmed to already know that Joe has a birthday on Sept 22nd and that his mobile phone package includes unlimited WIFI. Smalltalk can be easily factored into a smart agent or a chatbot, but the main objective is to get an answer and/or a resolution to the problem so that the customer has received (and the company has succeeded in providing) a smooth, positive and effective service transaction. A synthesis of a bit of familiarity with a positive result is the aim of great customer service – and this is when chat and help are done without the customer really caring if it is via a human or a machine. With fewer face-to-face encounters, do we want a chat or do we just want an answer with no smalltalk included? Does it matter if the system you are logged into doesn’t appreciate the nuance of the fact that you are celebrating your 35th birthday on the day your broadband is due to be upgraded thus resulting in a massive downtime of service? At Creative Virtual our systems are designed to offer personalised, effective and smart tools to create the chat/service balance, yet also “know” what the right triggers are for handing over to a real person when it’s time. An integrated handover allows the human agent to see the customer issue, based on the transcript, and then can add that extra element – the human touch – which may be a perfect ending to finding the solution. The chat and the serving of the solution with both a smart agent and a human all completed in one session – genius and still with time to exchange a “Happy Birthday” to the customer. Learn more by watching our recent webinar, Humans & AI: The Perfect CX Power Couple, on-demand or request your own live demo to see our smart tools in action. Happy Customer Experience (CX) Day! Move over Beyoncé and Jay-Z, George and Amal, Will and Jada. There’s a new power couple in town: Humans and Artificial Intelligence. While you’re not going to see them on the cover of a celebrity gossip magazine or walking the red carpet at a Hollywood premiere, the combination of artificial intelligence (AI) and humans is already making a mark on the world of customer experience (CX). With the growing emphasis customers are placing on CX when making purchasing decisions and the growing challenge companies are facing when delivering service and support on more contact channels than ever before, this powerful new approach has arrived on the scene at just the right time. Humans and AI make the perfect power couple for meeting CX expectations – they both bring something to the table, learn from each other, support one another and build together. Register now for Humans & AI: The Perfect CX Power Couple to see how organisations around the globe are already using the combination of humans and AI to provide successful customer service and how your organisation can leverage this new power couple to deliver a positive CX. Not able to make the live webcast? Don’t worry! A recording of the Tech Showcase will be sent to all registrants after the event. No longer a thing of fantasy or science fiction, artificial intelligence (AI) is finding a place in our homes, schools and businesses, helping to automate tasks and make our lives easier. For organisations striving to improve their customer experience (CX), implementing AI has become vital. The contact centre must play a key role in digital transformation initiatives around AI, automation and customer self-service in order to avoid creating silos that will damage CX. On Thursday, 14 June 2018, Chris Ezekiel, Founder & CEO of Creative Virtual, will join the expert panel of speakers for CRMXchange’s Tech Tank Roundtable Artificial Intelligence in the Contact Center. The live webcast, scheduled to begin at 7:00 pm UK time/ 2:00 pm ET/ 11:00 am PT, will feature insights on how to use machine learning and natural language solutions to make an immediate and positive impact in the contact centre. Chris will give an inside look at how Creative Virtual’s intelligent solutions help contact centres build better relationships with customers through centralising knowledge management, integrating chatbots and live agents, and combining AI and human input. He’ll explore recent statistics, discuss industry predictions, and share live demonstrations of current implementations. Chris will also provide some practical tips for implementing natural language virtual agents and chatbots to enable seamless customer engagement and help your contact centre improve through lower costs, reduced staff turnover, and more engaged, skilled and happier agents. Register for the Tech Tank now to learn more and see live demonstrations from Chris and other industry experts from CallMiner and NICE Nexidia. Not able to make the live webcast? Don’t worry! A recording of the Roundtable will be sent to all registrants after the event. The end of 2017 is quickly approaching and so, as has become our tradition, it’s time to take a look back at Creative Virtual’s year. To say this has been an exciting and busy year for us, our customers and our partners would be an understatement! 2017 will go down as one of the most important years in Creative Virtual’s history, so let’s take a look at some of the year’s highlights. By far our biggest company announcement came in April when we were officially recognised as the winner of The Queen’s Awards for Enterprise: Innovation 2017! The Queen’s Awards for Enterprise is the UK’s most prestigious business award for British companies, and we were recognised for innovation for our V-Person™ and V-Portal™ technology. Over the summer, our Founder & CEO, Chris Ezekiel, and CTO, Peter Behrend, attended a Royal Reception at Buckingham Palace for the winners and got to meet Her Majesty the Queen and several other members of the royal family. In September, the company hosted our official award ceremony and celebration, bringing together Creative Virtual team members from around the world, customers, partners and a variety of other guests in London. Mr Leslie Morgan OBE DL, Deputy Lieutenant of Greater London, presented our award on behalf of the Queen, and Jim Fitzpatrick, our local Member of Parliament (MP) for Poplar and Limehouse, also said a few words. Creative Virtual was recognised by a variety of other awards programmes this year as well, being named ‘Best Customer Service Solutions Provider 2017’, ‘Most Innovative Customer Support Tool: V-Person Live Chat’, and ‘Best Virtual Assistant Solutions Provider 2017’ among others. We were also a proud part of the APPEX Omnichannel Catalyst which took home the Outstanding Performance in the Catalyst Program award at TM Forum Live! 2017. Two individual members of our UK team were recognised by independent awards programmes this year for their contributions to Creative Virtual. Rachel F Freeman, Operations Director, was a finalist in the Women in IT Excellence Awards in the category of ‘Hero of the Year (SME)’ for demonstrating excellence in her support of others and going beyond the call of duty to achieve a business goal. And I was honoured to be named ‘Best CX Solutions Business Marketer – UK’ in the 2017 Business Woman of the Year Awards for my success in driving brand recognition, thought leadership and lead generation activities. It was certainly a big year for award wins for us as a company and individually! While we enjoyed celebrating – and walking the red carpet! – this year, we were also busy sponsoring and hosting industry events and delivering thought leadership presentations in 11 different countries – India, the United States, Hong Kong, the United Kingdom, Malaysia, France, Luxembourg, Singapore, Germany, Australia and Hungary. Our fifth annual Technology Innovation Showcase webinar (Chatbots, Virtual Agents and Your Contact Centre) with CRMXchange had a record-breaking number of registrations, highlighting the huge surge in interest in chatbots, virtual agents and artificial intelligence (AI). You can still watch that webinar on-demand, as well as our most recent webinar AI, Chatbots & Live Chat: Separating Truth from Myth. While there has been a marked increase in interest in chatbots and virtual agents this year, there’s also a lot of confusion, unrealistic expectations and false promises being perpetuated in the marketplace. We drew on our expertise to share a realistic view of AI and chatbots in the customer space in our whitepaper AI, Chatbots and Virtual Agents: The Threat to Mankind and the Contact Centre. Founder & CEO Chris similarly tackled this topic in a column for CMRXchange, Are Chatbots, Virtual Agents and Artificial Intelligence Threats to Your Contact Centre?. Chris also shared his expertise in interviews with ReadITQuik and The Wharf Newspaper, and Mike Murphy, CEO of Creative Virtual USA, shared his thoughts on the industry in a CRMXchange Executive Interview. Following on the heels of our launch of V-Person Live Chat last year, early in 2017 we created a new video showing how you can combine self-service virtual agents and human-assisted channels to deliver a fully integrated support experience. This year we welcomed a number of great organisations to our expanding Global Partner Network. Our V-Person Family continued to grow throughout 2017 with new virtual agent and chatbot deployments across the globe in a variety of languages, and our collaborations with current customers resulted in new features and functionality being added to existing installs. This year Motability Operations’ award-winning ‘Ask Mo’ and National Rail Enquiries popular ‘Ask Lisa’ virtual agents both celebrated their 10th birthdays. REST Industry Super’s virtual agent Roger played a part in two award wins for them this year: ‘Best Innovation Super Feature’ in Money Magazine’s Best of the Best Awards and ‘Best Fund: Innovation 2017’ in the Chant West 2017 Super Fund Awards. As he does every year, Founder & CEO Chris took the award for most travelling as he once again flew around the world visiting with the Creative Virtual team, partners and customers and taking part in a number of different events. In November, he also added a new job title to his CV, taking on the role of monthly technology columnist with The Wharf Newspaper. I hope you’ll take a few minutes to check out our 2017 in Review photo album on the Creative Virtual Facebook page. We’ve compiled shots from our official presentations and events as well as our fun group activities and award celebrations – everything from Founder & CEO Chris meeting to Queen to him taking a pie in the face during our fundraising efforts for the RSPCA. There will still be more photos to come, so be sure to like our Facebook page so you don’t miss any.